Cestem Flavoured Tablet for Large Dogs is a yellow brown divisible tablet containing 525mg febantel, 175mg pyrantel and 175mg praziquantel with liver flavouring. for the control of the following; Roundworms, Ascarids, Hookworms, Whipworms and Tapeworms. For oral administration only. The tablets can be given directly to the dog or disguised in food. No starvation is needed before or after treatment. For routine worm control adult dogs should be treated every 3 months. In the event of heavy roundworm infestation a repeat dose should be given after 14 days. For small dogs use Cestem. 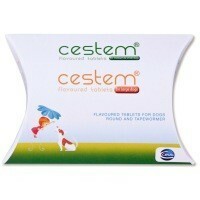 Use 1 Cestem tablet per 18-35Kg of body weight. It works but my dog refuses to take it. I have to mash it down and mix it with water and food. Arrived very quickly. Used on my 5 greyhounds with no problems. They do the job at half the price. Wow super fast delivery, only ordered yesterday and now my dogs have been wormed! Used this product before and it works great on my rottie staffie crosses, would definitely recommend. Good value and easy to swallow, all 3 dogs swallowed easily, fab product!! Good price. Tablets quite large can be difficult to disguise for fussy eaters. Does the job and no side effects. Bought this for my staffy x that weighs 21kg, after 6 hours she threw up a white bile twice which smelt just like the wormer, think this wormer was the culprit so not sure if the wormer has done its job correctly now.. Think ill stick to drontal and panacur granuals (",)* On another note, I bought 2 of the original Cestems for our other dog (16kg) and hes been fine with both tablets. Use these for my 2 Rotties and have had no problems at all.Good price as well. I'm not sure whether other wormers are the same as I've only used this one so far, but it doesn't agree with my greyhound.